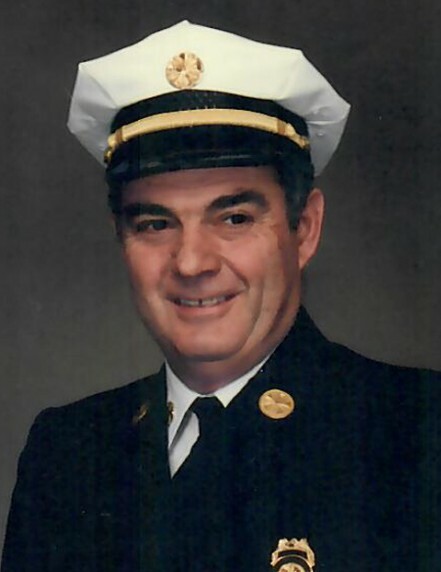 Henry A. Renaud, 76, of Aylsworth Ave., died February 5, 2019 in Landmark Medical Center, Woonsocket. Born in Woonsocket, he was the son of the late Albert and Geraldine (Desjarlais) Renaud. He leaves behind his high school sweetheart and wife of fifty-five years, Sandra (Delasanta) Renaud. He is also survived by his daughter, Lynn Hawkins and her husband Darrell of Cumberland; his son, Daniel Renaud of Charlestown; his brother, Denis Renaud of Woonsocket; two sisters, Pauline Campopiano of Woonsocket and Janet Leclair of Douglas; and four grandchildren Benjamin, Elizabeth, William, and Thomas Hawkins. An Air Force Veteran, “Hank” worked for the Woonsocket Fire Department for forty-one years, proudly serving as Chief for the last sixteen years of his career. He was a member of the Elks, the Seagrave Observatory, Skyscrapers in Scituate, a life time member of the Cercle Laurier, and as a long time coin collector, the Blackstone Valley Coin and Collectibles Club. He was a former manager of Bernon Little League, an avid golfer and sports fan. He was his grandchildren’s number one fan, watching them participate in everything they did – big or small – a steady, reassuring presence radiating his unconditional love and pride. His funeral will be held Wednesday, February 13, 2019 at 9 AM from the Holt Funeral Home, 510 South Main St., Woonsocket with a Mass of Christian Burial at 10 AM in Precious Blood Church, 94 Carrington Ave., Woonsocket. Burial, with Military Honors, will follow in Resurrection Cemetery, West Wrentham Rd., Cumberland. Calling hours are Tuesday from 5 - 8 PM.